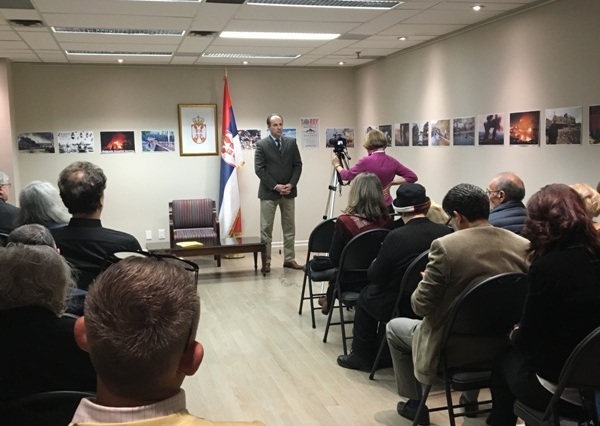 On the occasion of the beginning of NATO Aggression on the Federal Republic of Yugoslavia (FRY) in 1999, a Commemoration of the civilian victims was been held in the Consulate General of the Republic of Serbia in Toronto, with a reference to the Pogrom in Kosovo and Metohija in 2004. During his presentation, Consul General Vasilije Petkovic said that NATO aggression on the Federal Republic of Yugoslavia bigen 20 years ago on MArch 24th, 1999, following the failed negotiations on the resolution of the crisis in Kosovo and Metohija in Rambouillet and Paris in February and March 1999. After the negotiations, the FRY Assembly decided not to accept the article of the Agreement on the presence of foreign troops in its territory, after which, at that time, the NATO Secretary General, Javier Solana ordered on MArch 23rd 1999, the launch of air strikes, which was in fact a decleration of war. The offered Rambouillet Agreement was practicaly an ultimatum, in a sense, as it was the ultimatum of the Austro-Hungarian Empire to the Kingdom of Serbia, demanding the presence of foreign inspectors on Serbian territory. In both cases, a request for the presence of foreign investigative bodies and military forces in the territory of a sovereign state was unacceptable for our country. On March 24, 1999, at 19.45 hours, air strikes on Serbia began and Yugoslavia declared the state of emergency that night. During the 11 weeks of bombing, about 2,500 civilians were killed, including 79 children, and 1,008 members of the Armed forces of FRY. NATO aggression was a terrible crime against the Serbian people, which continues even today trough its consequences. There were many examples of bombardment of civilian targets and refugees that couldn`t be definde as "collateral damage" because "it was obviously that these were non military targets". Although NATO propaganda wanted to show military action as part of the humanitarian action in order to resolve crisis in Kosovo and Metohia, the most vulnerable civilians were the residents of our Serbian southern province of Albanian nationality, who fled to as a refugees to central Serbia. In such two attacks, out of 185 in total, 30 newborn babies were killed, which, beside Milica Rakic and other innocent children and civilians, was an unaccountable war crime in the modern era of Europe. Last year, the Serbian Parliament formed a State Commission for investigating the NATO bombing in 1999, and it`s impact to the health of Serbia's citizens and the environment.